As a Toronto wedding photographer, were about 30,000 couples get married every year, I'm often invited to document weddings abroad and invariably, some of them are destination weddings. Such was this Barcelo Maya Palace Deluxe wedding I photographed a while ago. 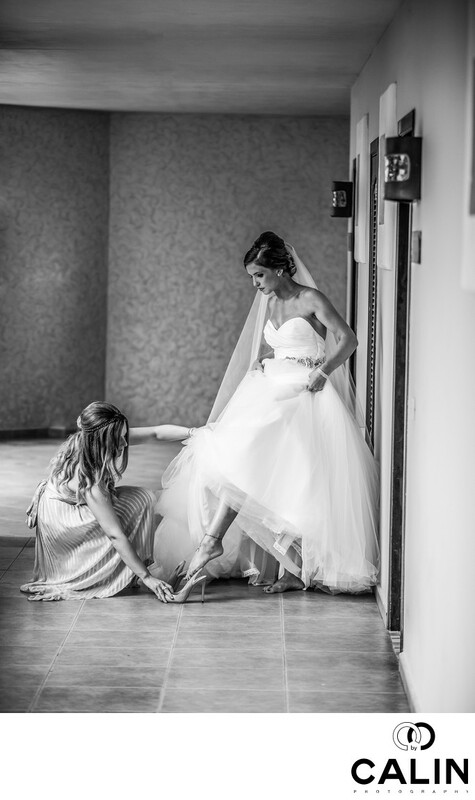 In this wedding picture, we can see the maid of honour helping the bride put on her shoe in preparation for her wedding ceremony. Because we were under serious time constraints, the bride finished her final touchups, including her putting on the shoes on one of the hallways at Barcelo Palace. Despite the fact this looks like a posed photograph, it was hundred percent candid. The bride stormed out of the room and the scene took less than a minute. However, as a candid Toronto wedding photographer I learned to react quickly when such moments unfold. One of my tricks is to use a semi automatic mode (Aperture priority) when I know that the light will change dramatically in a short period of time. In this case, the difference between the indoor light and that outdoor was about six stops. In other words it would have taken me 18 clicks of the shutter wheel to adjust the exposure. If I shot in manual mode the scene, I would have most certainly missed the moment. To create this photo I used a Canon 24 to 70 mm lens shot around 50 mm at f2.8. The fact that both the bride and her maid of honour were at the same distance from the camera placed them in the same plane of focus. What makes this picture beautiful is the genuine expressions of the maid of honour, who kneels in front of the bride to help her put on her shoes. The bride, graciously extends her leg in a move that reminds us of a ballerina. The fact that both the bride and the bridesmaid look at the shoes draw our attention to them and create a triangle. Triangles, are appealing composition elements that increase the power of a photograph. A way of learning more about wedding photography is to study the master photographers. As a matter of fact, I regularly take workshops and purchase training videos from top 10 wedding photographers in the world, not to mention the large wedding photography library I built over the years. That is how I learned that to convey the message that a certain wedding picture belongs to the documentary photography genre, one can desaturate the image and process it as a black and white shot. This image underwent a more rigourous post production process then the usual pictures because the background contained distracting elements. As such, to make the bride and her bridesmaid the focus of this picture I eliminated some paintings and sconces that were hanging on the wall behind the bride. Also, by converting the image into black and white I removed the distracting colours in the scene so that the viewer can focus on the main subjects of this picture: the bride and her bridesmaid.